The biggest thing I noticed, outside of our garage and yard, is that fact that the City of Lacey has begin putting up their Christmas banners on the light poles around town. I will have to go back and see if I commented on this last year, but having noticed it this year on the 4th of November makes me wonder if they are early or if that’s the norm? Either way, wicked awesome!!! Update: 11/8/09 – The banners are up all over town! Gotta love it! With Halloween officially over, even though I was out way too late last night at a party, I was up and out the door this morning to bring in the Halloween lights and start deploying the Christmas lights!! WOOHOO! Today I got 3 outta the 4 window frames up, 12 mini trees and 8 reindeer. That opens up room in the garage to work on more stuff to go out this week. YEEHAW! T-Minus 1 month to go and counting…. 1 month from RIGHT NOW the lights will be coming ON! While I am getting excited to see the finished product, I am still quite nervous that everything will come together just right! I guess that really stems from the issues that we had last year with the controllers, be that power leak issues or controllers losing the ID’s. Either way, combine that with the problems we have already encountered this year and anxiety is mine! Beyond all of that, we start deploying lights on Sunday. I am ready to get things set up so I can check them off my list. I have all 12 of the mini trees ready, all 4 of the window frames as well. I still need to redo the 6 foot twig trees, both of them, and make sure that my large “Merry Christmas” sign is still working good. Do to issues we had with it, I think it will go out last this year. For the roof, I still need to test the Bethlehem Star and re-rope 2 of the rope light snowflakes. I am also considering building frames for our “Listen To” signs, so if I am gonna do that, I gotta month! I think the hardest part, other than needing good weather so my elves will be safe up on the roof while putting those lights up, will of course be the wrapping of the lights on the 7 bushes we use. While it’s not hard, at all, it is frustrating and time consuming. I do have an elf/brother that said he would help me with stuff and that’s a biggie to me. All of those lights from last year were rolled into “Light Balls” so they will NOT be tangled, which should make it go much smoother. So here we are…. 1 month to go. I best get on finishing up my sequences, huh? The mini trees are done!!! 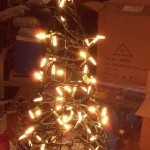 Last year, pretty close to this exact time, I sat out in my garage wrapping lights to make mini trees. It was a learning experience, for sure. Due to getting that bad batch of LED lights, I got to spend a few days this past week doing it all over again! However, they are done, so it’s time to move on to something else, but before I do, let me share a bit of how I make my mini trees…. I learned how to do this by reading about how others did theirs online. 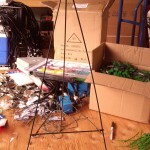 I start off with a 30 inch wire easel from my local craft store, in this case its “Michaels”. Since it doesn’t sit even, I clip off the leg on 1 side so it does. I then take a zip tie and secure the bracket on the leg and make sure its good and tight. 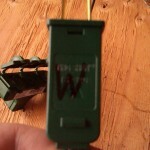 After testing my lights to make sure they all light up, I grab my sharpie and label the plug so later I will be able to tell what color that plug belongs to. 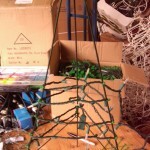 From there its a matter of wrapping the lights around the easel, stopping at each leg to zip tie it tight. After working my way around all the way up to the top, with a decent amount of space between each row, I work my way back down. Once all the lights are secured to the easel, I move on to the next color and start it all over again. 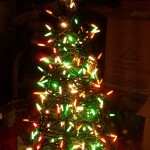 Eventually I have 3 strings of 70 lights in White, Green and Red for a total of 210 lights on each mini tree. Pretty simple really. What you have to remember the most is that you want to have as many “points of light” to be seen, but the overall “glow” is what I feel is most important. 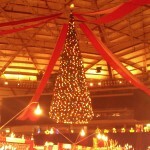 After really enjoying it last year, my wife and I decided to go to the opening day of the Tacoma Holiday Food & Gift show at the Tacoma Dome this afternoon. 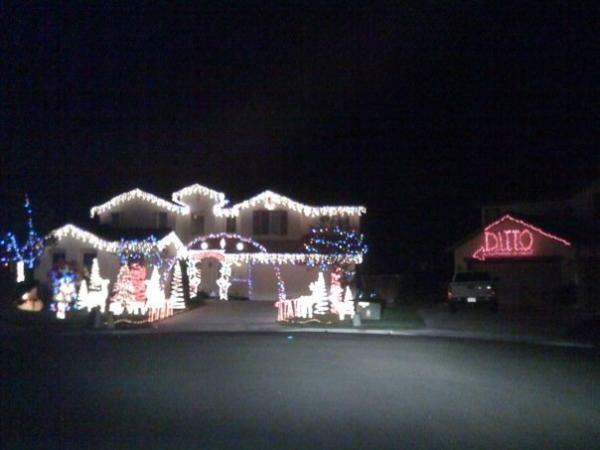 When it comes to putting you in the ‘Christmas Mood’, it certainly did not disappoint! We didn’t buy anything, like last year, yet between all the great decorations, the beautiful lights and the Christmas music they were playing the entire time we were there, it was just awesome! Ticket cost $11 (we had a $1 off coupon, so $10 for us) and I saw someone there with a “2 for 1” coupon from a local radio station that was good for the 1st day of the show only… gonna have to look into that for next year! Parking was $8, the same as last year. What really stinks is that my wife had to use a wheel chair, she had surgery 2 weeks ago, and there were no handicapped parking spots available (yes, we have a handicapped parking pass). Once we got in and started looking around I knew where I wanted to go and that was to find “Sandy’s Candies”. 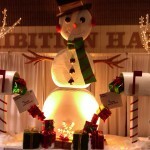 Last year I got the most amazing Egg Nog Fudge from that booth. I actually tried making it myself a few times and since my attempts sucked, I have been telling people how incredible it was there from the show. I knew right where the booth was. As we got closer I could almost taste it. When it was finally time, I stepped up and started looking for it so I could order a pound (to have plenty to bring home and share with everyone). I couldn’t see it though… where was it?!?! So I asked and was told, “We didn’t bring the egg nog this year.” WTF!?!? I was FUDGE DENIED! UGH!!! Oh well, I guess I didn’t really need the calories anyway, huh? The show is fun and after 2 years of going to it I am hoping we make it a Christmas Tradition… would be a great way to kick start the most festive of seasons! Btw, Karolyn Grimes (aka Zuzu Baily) was there again as well. She was busy signing pictures and dvd’s for anyone that wanted one and there was a line! So here we are, 42 days left until Thanksgiving and the start of this years Christmas Light show and I just tested the web cams and they are both fully operational! WOOHOO! They will be online from time to time over the next 42 days, check them out, on the “Web Cams” page, cause the tree across the street from us is incredibly beautiful with all its amazing fall colors!! I was out working in the yard yesterday, I had to do some landscape work (aka cutting bushes back and so on..) to get ready to start putting up the lights and a couple walked by asking if I was getting ready. Told them I was and couldn’t wait! People are already looking forward to it… crazy! Spent some time in the garage today testing controllers. Other than the 1 controller that is running the Halloween lights, I still had 6 more 16 channel controllers to test and make sure they were still in good working order. All but 1 of them were discovered perfectly via the “Hardware Utility” (HWU) and the one that wasn’t had simply lost it’s ID, so I hooked it up directly and reset it… works fine now. I did notice that on my #6 controller that channel #5 does not work at all. Gonna have to get that working, if not I will have to find a work around for it. Yesterday I was finally able to unpack and test my LED lights. These are the ones, if you remember me talking about them last season, that I got via the PlanetChristmas.com presale held by Paul @ Creative Displays. We had finally taken the plunge into LED’s and got in on a great deal with the presale that Paul holds every year. Bottom line, these lights SUCKED!! They were so bad, and Paul knew it, that he would reship replacement sets to everyone that said they needed them and I needed several myself. He eventually made a deal with everyone that said we could use them, if they worked, for the season, then ship them back to him (at our cost) and he would ship us brand new 2010 LED’s when they can in (at his cost). I got my boxes in mid June but got to unpacking them just yesterday. 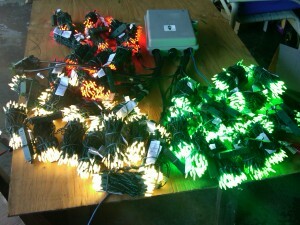 I realized when doing so that I was missing 12 strings of C6 sized green LED’s. All I had to do was email Paul and he said he would have them in the mail to me on Monday. Very cool! !